This transcription is the piano part for "River" as played by Joni - another classic piano piece from her album "Blue". It's not a difficult piece to play - the key is getting the phrasing, the changes in dynamics and tempo right. 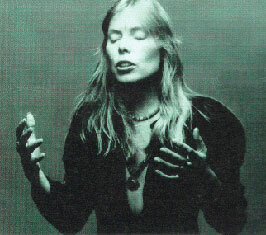 Anyone who's played some of Joni's other piano pieces from this era will be on familiar territory with the basic style: steady root-fifth-octave patterns dominating in the left hand, with the right hand filling in triads, sixths and melodic fragments. As there are subtle changes in what's played for each repeat of the verse and chorus sections I've transcribed Joni's piano part in full here, rather than rely on repeat symbols. Listen to the original recording to pick up the important changes in dynamics and tempo. It's a beautiful song, so enjoy! River starts with the "Jingle Bells" theme played by the right hand in sixths, with the left hand starting with familiar rising-falling root-fifth-octave patterns in eighth notes. Note however that the left hand pattern is varied by changing the top note of the rising-falling pattern, using 9ths (2nds) and 10ths (3rds) in bars 3-6. Similar variations in the left hand occur throughout the piece. Note also that throughout the song, whenever there is a chord change the left hand plays a quarter note (instead of two eighth notes) at the end of the bar, giving the hand time to move to a new position and also giving some structure to the song. 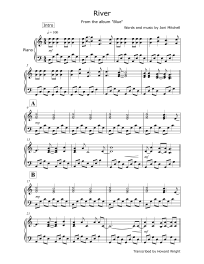 In the second half of the first verse (bar 17-20, "But it don't snow here...") the left hand pattern changes again, alternating between the fifth and upper octave notes for most of the bar. It's a subtle change, giving a slightly more free or even "floating" feel to the rhythm. It's interesting to see how the right hand part for bars 22-24 is made up almost entirely of two notes (A and C), in some simple repeated patterns. These notes are somewhat "against" the harmony for bars 23 and 24, giving an interesting tension. Note also the space in the right hand part in bar 23 (a single note, sustained and repeated). This use of one or two long sustained notes is also used later in the song. Another idea used elsewhere in the song is the semitone clash between left and right hand parts in bars 38 and 39 (notes B and C), giving a tense minor added 9th harmony. Where's the file? Looking forward to seeing the music. Thanks!